Izzat Ibrahim al-Douri, who was right-hand man to Iraq’s ex-leader Saddam Hussein, has been killed, Iraqi officials say. They say the fugitive militant leader died in fighting in Salahuddin province, north of Baghdad. His supporters have denied the claim. Izzat Ibrahim al-Douri, 72, led the Naqshbandi Order insurgent group, a key force behind the recent rise of Islamic State (ISIS). He was deputy to Saddam Hussein, who was ousted when US-led forces invaded Iraq in 2003 and executed in 2006. 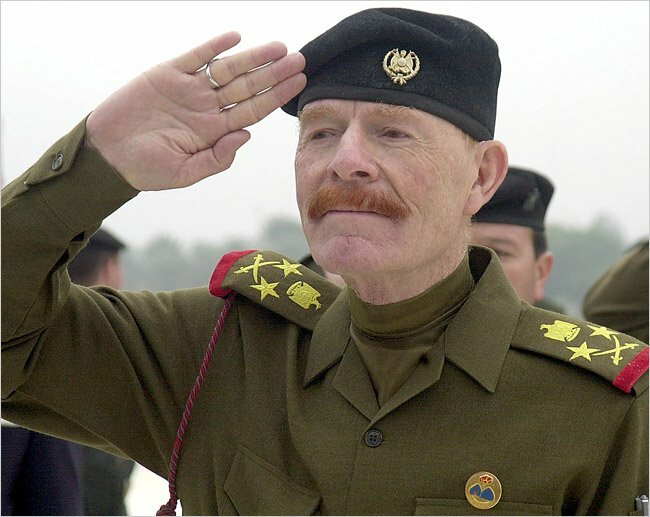 Izzat Ibrahim al-Douri was regarded as the most high-profile official of Saddam Hussein’s Baath party to successfully evade capture after the invasion, and had a large bounty on his head for years. He was the King of Clubs in the famous pack of cards the US issued of wanted members of Saddam Hussein’s regime after its defeat. There have been reports of Izzat Ibrahim al-Douri’s death or capture before. The now dissolved Baath party denied the latest claim. However, al-Arabiya TV showed a picture of what it said was Izzat Ibrahim al-Douri’s body. Salahuddin governor Raed al-Jabouri said he had died during an operation by soldiers and allied Shia militiamen east of Tikrit – a city that was recaptured by the government two weeks ago. Izzat Ibrahim al-Douri is believed to have played a key role in masterminding a major offensive by ISIS in 2014. ISIS seized swathes of territory in eastern Syria and across northern and western Iraq, in an effort to establish an Islamic “caliphate”. In recent months Iraqi forces – backed by US-led air strikes since August – have recaptured 25% to 30% of the territory initially lost to ISIS. ISIS still controls large areas in Iraq, including Mosul, the country’s second largest city.